I went to the grocery today to buy some fresh-baked, savory rosemary bread. I got addicted to it at Kingfisher restaurant while living in Tucson. I do my grocery shopping at a major chain grocer which has a nice bakery section. It has all the equipment of a real bakery. 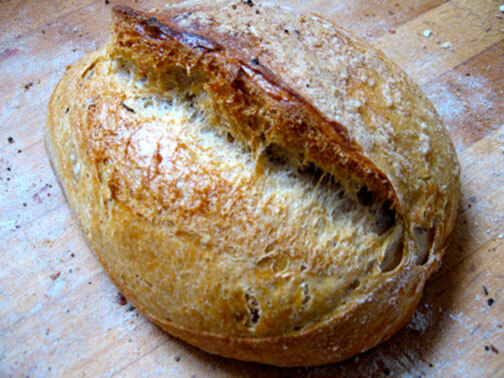 Plus, the bread always looks fresh-baked and tastes great. However, when I went shopping early this morning, there was no rosemary bread on the elegant wooden racks. “No problem,” said the baker, “I’ll get you a loaf.” Great, I thought—fresh out of the oven! Actually, it was fresh out of the freezer. Rosemary bread and Kerrygold Dubliner cheese make a great grilled cheese sandwich to eat while you’re painting. Photo courtesy of Coquette Bakery, who makes the real thing. It looked good and tasted fine, but my mind wouldn’t accept it. It was counterfeit. It was not the real thing. It satisfied my hunger, but not my soul. This experience reminded me of a lesson that my father taught me when we travelled together eating at fine restaurants. “Never go into the kitchen where the food is prepared. You’ll lose your appetite,” he advised. When I started my design consultancy I applied the lesson. My clients were delighted with my ideas and strategies on how to improve their products and increase their revenues. They always wanted to know how I made the magic, “How do you pull the rabbit out of the hat?” Of course, I couldn’t let them into the “kitchen” for them to see how simple it was and hope to continue to charge high fees. While it was simple for me, however, it was beyond their knowledge or ability to attain the same results. Now that I’ve turned artist, I’m puzzled by the advice that we are given which encourages us to allow collectors, as well as critics and curators, into our studios. Presentation is critical to sales—ask any retailer. For that matter, ask any gallerist. Galleries (the good ones) display their artwork in a pristine environment free from unwanted distraction. So, they rarely allow collectors into the back room (the kitchen) where additional artworks are stored—and for good reason. Looking at artwork from the front they all look much the same: rectangular in format, flat surface with a great image painted on canvas. The flip side, however, is a different matter. Every manner of construction and material is used for the foundation of these works of art including rough lumber wood, old picture frames, cheap stretcher bar imports, plywood, angle irons, wire, carpet tacks, glue, duct tape, etc. The national market research survey that I commissioned (in my quest to develop a better stretcher bar) showed that artists didn’t particularly care about the foundation of their art— only the painting itself. Gallerists weren’t much different in their opinion. As the gallery owner noted, the collector rarely sees the backside of the canvas. That is until a problem occurs, which tends to happen in its new home or office environment while hanging on the client’s wall. What then? Blame the artist? Blame the gallery? Who’s going to fix it? Generally, the gallery owner, concerned for her reputation, will stand behind the artwork and undertake to fix it. Unfortunately, rather than sending it back to the artist, it’s more cost effective for them to send it to a frame shop. There, the painting is removed (carefully, I hope) and stretched over a new wooden stretcher bar (which will also eventually warp). In the process, they may have to lose some of the painting in order to have enough selvage to stretch it — a decision that’s taken out of the hands of the artist. Two artists replied: “reputation” and “pride”. They stressed that being an artist is their livelihood; they are professionals who always strive for the best. One artist summarized this question beautifully: “This is not a hobby.” Yet, ironically, many of these professional artists paint on the same cheap wooden stretcher bar imports that the hobbyist uses. Positioning statement: enables the professional artist to differentiate themselves from recreational artists and hobbyists who are painting on wooded stretcher bars. In summary, if you’re going to invite collectors and others into your kitchen (studio) where they are likely to see what foundation you’re painting on, make it the best—DrumTyght™ extruded aluminum stretcher bars, available late fall 2015. Posted in Drumtyght Stretcher Bars and tagged benefits to artists, canvas, Drumtyght™, rosemary, stretcher bars, warped canvas. Bookmark the permalink.